VfB Stuttgart vs Borussia Dortmund witnessed a return to the Bundesliga for Markus Weinzierl, and the ex-Schalke boss got off to a terrible start as Stuttgart head coach. Dortmund scored after just two minutes and never looked back. Not content with leading the assist totals for Europe’s top five leagues before the international break, the English winger opened the scoring after three minutes as Dortmund returned to Bundesliga action. Sancho had made all the headlines during the international break and his future was the subject of many column inches back in England. However, as the Futbolgrad Network learned no price has been put on his head by die Schwarzgelben. 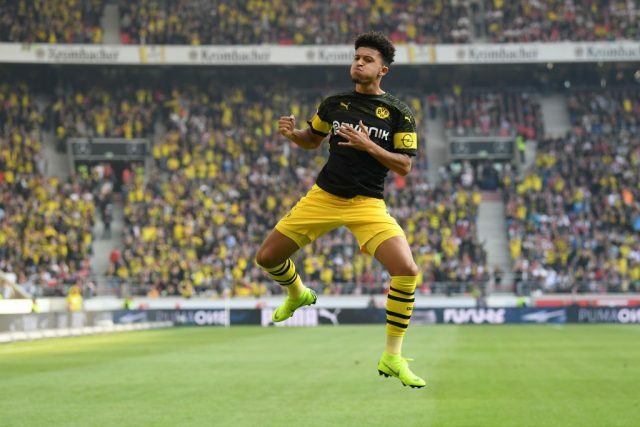 The 18-year-old continued his excellent form for the German league leaders, working well with both Marco Reus and Jacob Bruun Larsen – Dortmund look a frightening prospect with this current trio of stars. With Dortmund inflicting maxim damage to Stuttgart early on, the Englishman’s second half was much quieter as Favre slowed the play – the Swiss coach had an obvious eye on the Champions League midweek- but Sancho’s danger when attacking was still evident. On the day Barcelona confirmed that Dortmund would take up their option to buy the Spanish forward, Alcácer once again had a wonderful game in black and yellow. Stuttgart had a warning early on, just moments after Sancho’s opener the 25-year-old went close- driving his shot just wide of Zieler’s left post. He wasn’t to make the same mistake on his next sight of goal. A sublime chip, just 75 seconds after Reus had made it two-nil, sent the watching fans in the far corner of the Mercedes-Benz Arena into dreamland. With not even half an hour gone Dortmund were flying. With his seventh goal in just 106 minutes of Bundesliga action, the Spaniard again gave indication that Dortmund had found the striker they craved. His audacious chip left Zieler a bystander and captain Reus was that impressed he shook his head and waggled both index fingers – to suggest the quality was of the highest order, and he was correct! 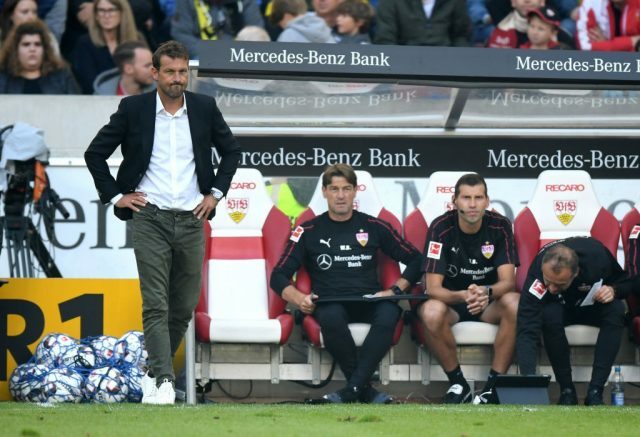 Despite this shaky start to life at Stuttgart for Weinzierl, the new head coach at VfB will have been impressed by the second half showing from his side. The hosts came out three-nil down but that didn’t stop them fighting. Mario Gomez missed from 3 meters out, firing his shot high over the bar – then Roman Bürki found himself called into action. The Dortmund ‘keeper made a fantastic double save to deny a comeback goal on 52 minutes. At no point did die Schwaben give up, despite the scoreline. Stuttgart will look back at the first half and wonder if they paid too much respect to Lucien Favre’s high flyers. Had Weinzierl’s front men had their shooting boots on it could have been a closer ending than the scoreline suggests. Maximilian Philipp’s fourth for the visitors was perhaps a bit cruel given Stuttgart’s second half intent – when you’re stuck at the wrong end of the league sometimes luck just evades you.